We currently supply rope to a company called Huubie Build which is based within Orpington, They create unique and bespoke products for children's play areas. Heres some information from their facebook about what they do. "Huubie Build is tailored to your specifications, the overall size and design of your adventure play frame is largely down to your imagination, safety is paramount and all ‘Huubie’s’ are built with your children’s safety in mind, with tailor-made design touches that add to the safety of our product without spoiling the overall aesthetics and blend well within its natural environment, your garden or outdoor space! Built to last and designed for living, Hubbies’ can be made from any available soft or hardwood, from treated pine to green oak, the choice is yours, incorporate ladders, monkey bars, see-saws, fireman’s poles, slides, ‘wobbly bridges, tree houses, swings, jousters, bars and hoops… and there’s more… rock climbing walls, rope nets, Tee Pee covers, car tracks, rope swings and sand pits with covers to mention the main points, we wont tell you about the secret trap doors! 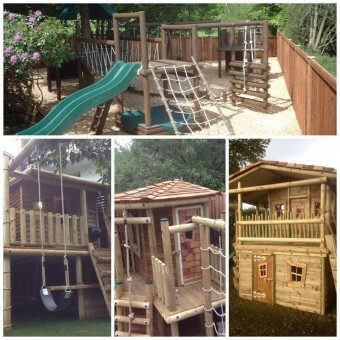 Our adventure play frames and tree houses are as unique as the outdoor space in which they are built, as are our bespoke traversing walls, consisting of rock wall holds secured onto existing masonry walls or a timber structure to excite and entertain offering challenging horizontal climbing routes for any age to enjoy. We also offer bespoke design-build service for playhouses, planters, storage, shelters and seating, all these products can be constructed to any size or design, planters are ideal for planting projects and disabled access, can be used as dividing points in your garden or outdoor space, our products are as unique as the space in which they are built in. Huubie Build offers a service that will transcend through generations and make the outdoors interesting on a different level adding excitement and adventure and still retaining its beauty, the possibilities are endless and make outdoor play equipment fun, challenging, affordable and above all safe We do not have price lists or glossy brochure as each Huubie play structure or HUUBIE build product is uniquely tailored to suit you, sitting on any ground whether uneven or sloping, we offer a consultation, basic designs and the opportunity to own your very own sculpture in the setting and size of your choice. Each HUUBIE play structure is built bespoke to your requirements and with stringent safety features incorporated as standard.